I'm back after a short vacay in Mangalore :-) I had so much fun there!! It's nice to be back home now & I was so happy to come home to this lil bundle of surprise. I just had to share what I received for the month of May 2015, with you. The 70 gms of product comes packaged in a plastic tub with a coppery aluminium cap. It has a strong herbal, Ayurvedic scent to it. It contains goodness of Jojoba oil, Lavender oil, Rosemary oil, Carrot seed oil and other lovely ingredients, blended with brown rice to make a natural scrub. 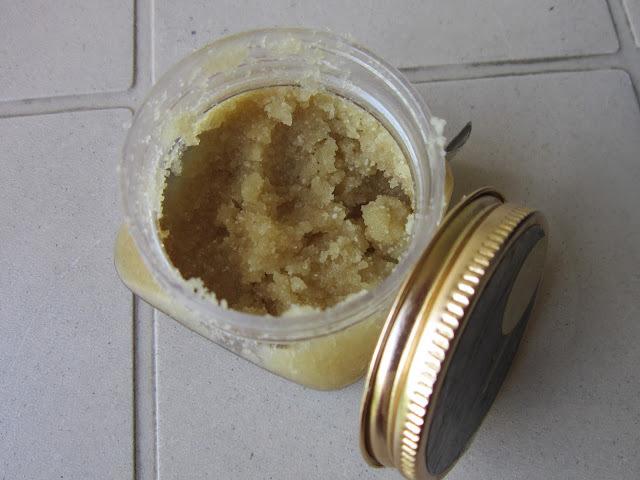 I really liked this Rice Scrub over my normal Walnut scrub since this is less damaging to the skin; rice makes for a smoother scrub than most walnut & apricot kernel scrubs available in the market. Also, after the rice grains have gently exfoliated the skin, the oils in the product leave the skin feeling well-moisturized (unlike my regular one, which needs to be followed up quickly with a moisturizer!!) 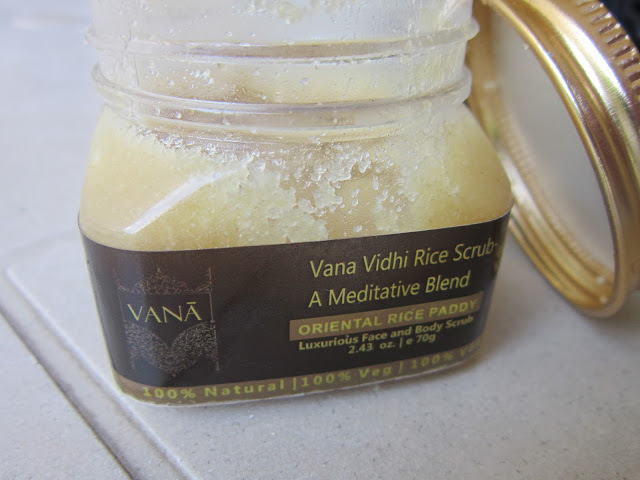 I would still suggest a moisturizer after any kind of exfoliation, but this rice scrub can be followed up with a light-weight one :-) Another plus for this product is that its free of Sulphates & Parabens!! With all-natural main ingredients like Masoor, Almonds, Aloe Vera, Honey, etc..this one's exclusively for the face. I received this product in a small plastic, ochre-yellow tub (sample size). I took a pea-sized amount on my palm and added a few drops of water to make a paste and then applied it to my face. With mainly an almond scent, this product is really refreshing and leaves your skin feeling soft & supple. I haven't tried removing my makeup with it, in spite of the 'cleanser' claim :-) I have only used it at night before going to bed for a squeaky-clean face. I forgave the "expensive" scarf debacle, all thanks to this beauty right here!! When I saw reviews & unboxing videos of the May Fabbag on different social media channels, I had hoped to receive this particular product rather the Makeup Stick. Dont get me wrong, the Makeup stick is great too; the eye shadows were just my preference. The quad contains 4 shades (duh, Neha! Obviously!) - Scarlet, Bora Bora, Risky Business & Rock Bottom. I don't exactly know which one's which but I'm absolutely in awe of the pigmentation!! 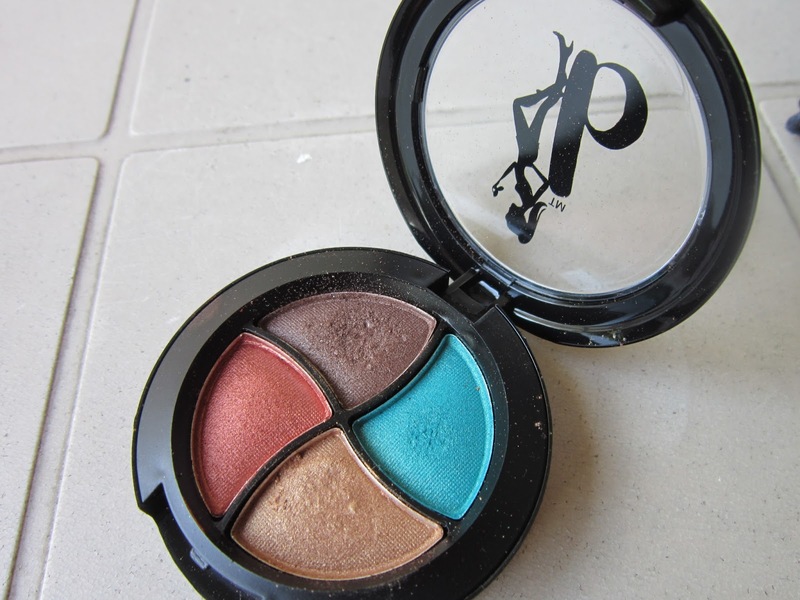 These shades are insanely pigmented and you need very little product to create a bold, colourful look. Here's a simple look I created wit the quad - I put the 'goldenish' shade all over my eyelid, used the 'taupey-brown' on the outer-V of the eyelid & then blended both with the 'coppery orange' (LOL yes, those are the names I'm gonna roll with!) 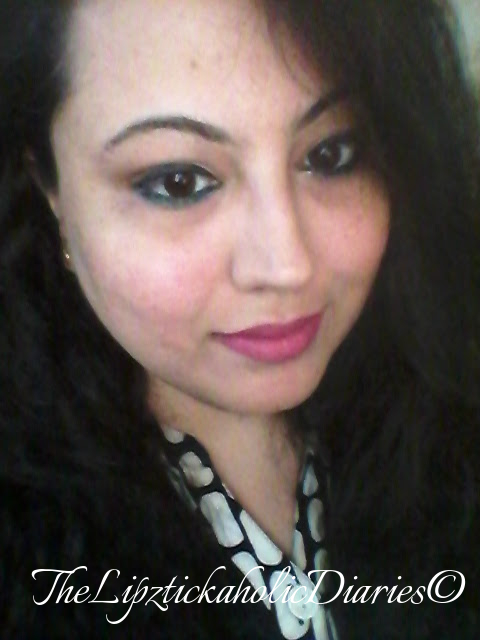 I also blended my kajal on the lower lash line, with the vibrant Blue shade in the quad, which ended up becoming a highlight of the whole eye-look. And no, I wasn't trying to recreate the 'Ash at Cannes' look with the blue lower lash line...it just happened to be there & I used it...hahaha! Really liked this month's products, I must say. 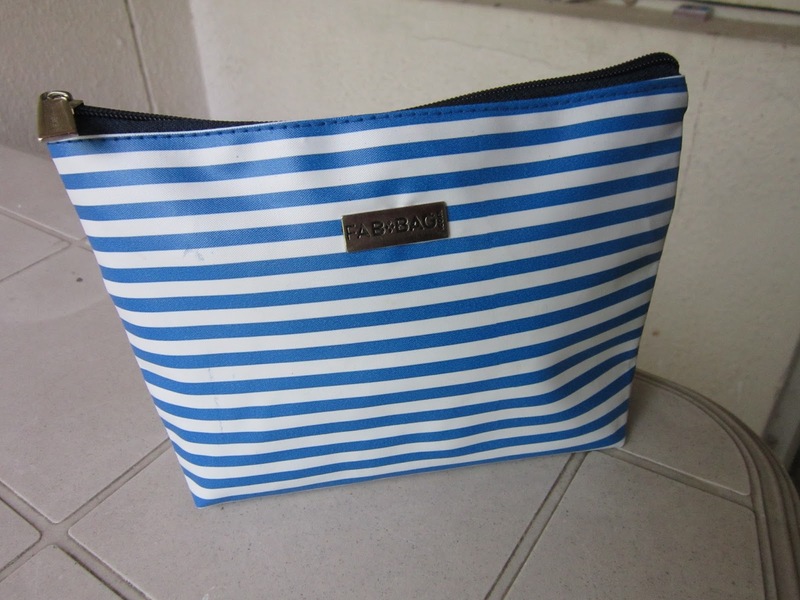 I also really liked the nautical striped, water-proof bag that the Team has sent this time :-) Maybe because I love the sea, maybe because my Dad was in the Navy, I don't know...but I liked how simple, casual yet sporty it looks! Until the next time... Ciao! 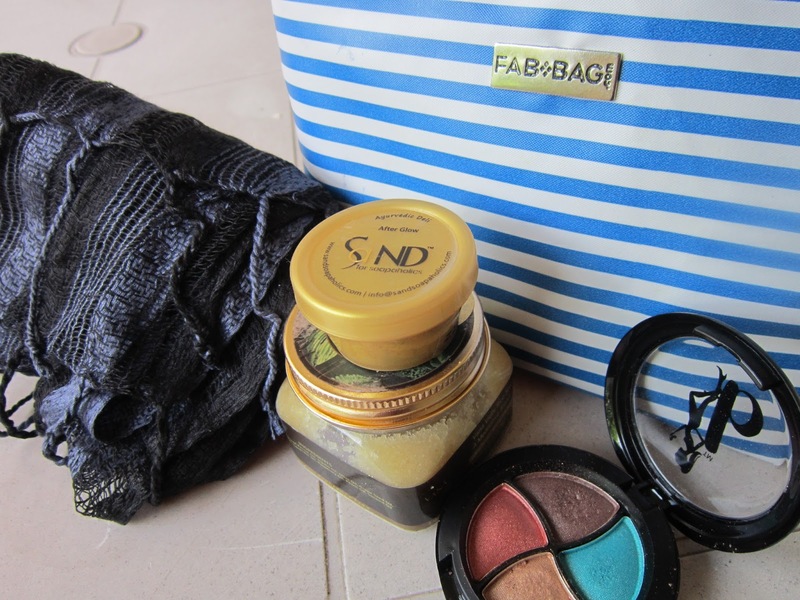 Hey Neha, I had subscribed to fab bag after checking out your reviews. And this month I received my first bag. 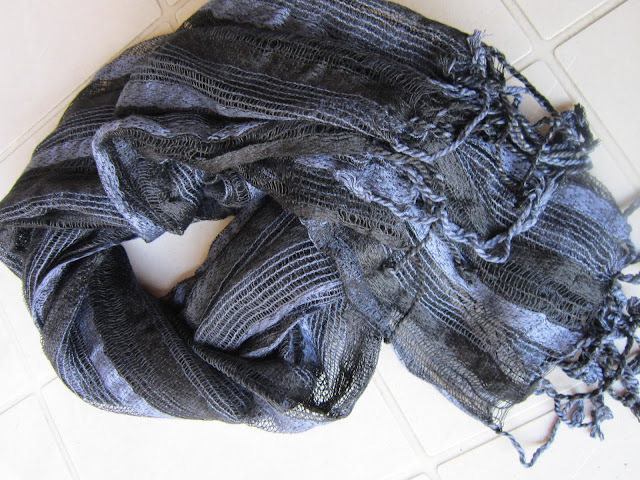 It has some nice products and the scarf that I got in the bag is much better than the one in your picture. 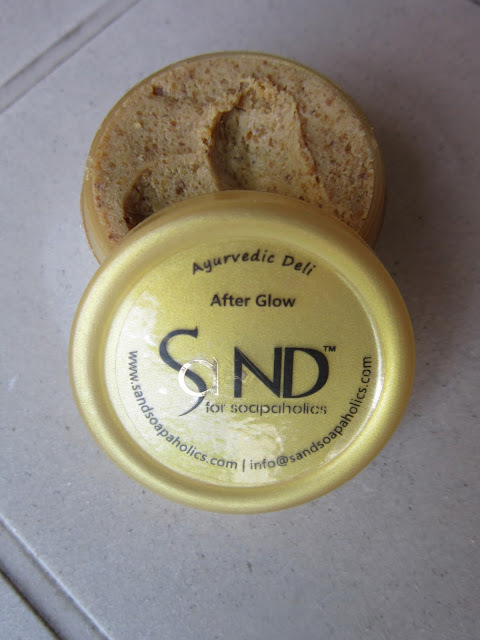 I did use the After Glow Face Cleanser as well, mine is with haldi. 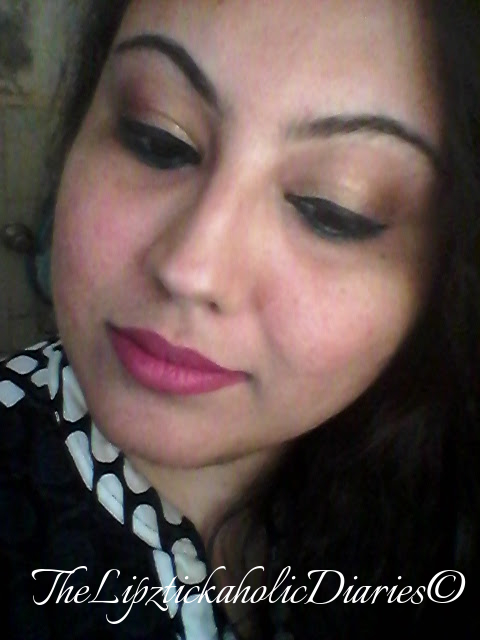 Thanks for introducing me to this concept and keep up the good work with the blog..
Deepika Padukone inspired Makeup Look from "Piku"